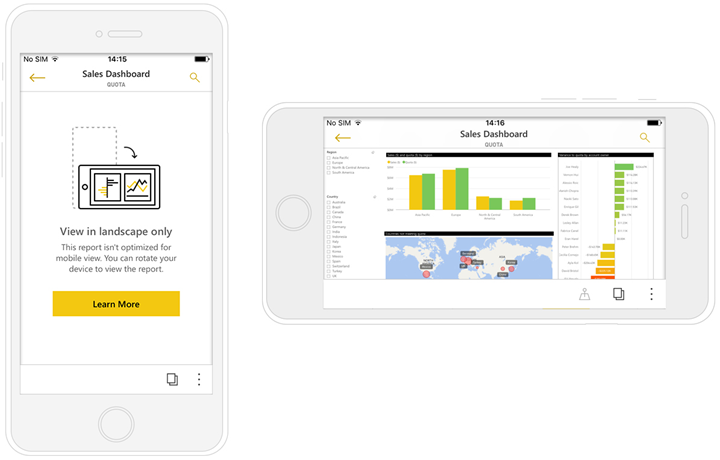 When you create a Power BI report in Power BI Desktop or in the Power BI service, you can also create a version of that report optimized for viewing in the Power BI app on a phone. 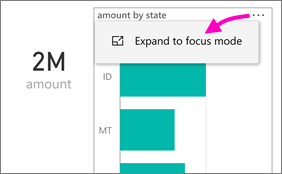 Then, when you open a Power BI report on a phone, Power BI detects if the report has been optimized for phones and automatically opens the optimized report in portrait view. If a phone-optimized report doesn’t exist, the report still opens, but in the non-optimized landscape views. Even in a phone-optimized report, if you turn your phone sideways, the report opens in the non-optimized view with the original report layout. If only some pages are optimized, you see a message in portrait view, indicating the report is available in landscape. If a phone-optimized report has filters defined, when you view the report on a phone you can use those filters. The report opens on your phone filtered to the values being filtered in the report on the web, with a message that there are active filters on the page. You can change the filters on your phone. Tap the filter icon at the bottom of the page. Use basic or advanced filtering to see the results you're interested in. 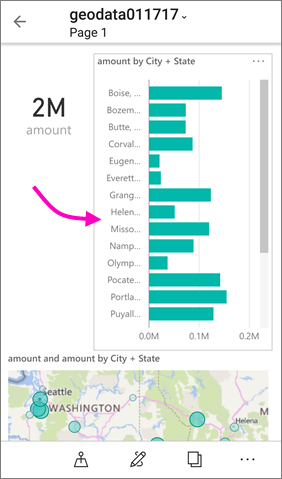 Cross highlighting visuals in phone reports works the same as it does in the Power BI service and in reports on phones in landscape view: When you select data in one visual, it highlights related data in the other visuals on that page. 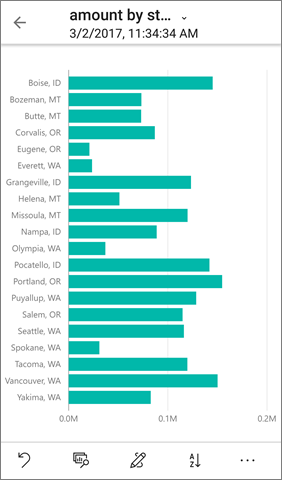 Read more about filtering and highlighting in Power BI. In phone reports when you select a visual, the phone report highlights that visual and focuses on it, neutralizing canvas gestures. With the visual selected, you can do things like scroll within the visual. To de-select a visual, just touch anywhere outside the visual area. Phone reports also offer a focus mode, so you can get a bigger view of a single visual and explore it and the report. In a phone report, tap the ellipsis (...) in the upper-right corner of a visual > Expand to focus mode. What you do in focus mode carries over to the report canvas and vice versa, for a seamless exploration experience. For example, if you highlight a value in a visual, then return to the whole report, the report as a whole will be filtered to the value you highlighted in the visual. Drill down into the information displayed in a visual. Read more about drilling down and up in a phone report, below. Sort the values in the visual. Revert: Clear exploration steps you've taken on a visual and revert to the definition set when the report was created. To clear all exploration from a visual, tap the ellipsis (...) > Revert. Revert is available at the report level, clear all exploration from all visuals, or at the visual level, clearing all exploration from the specific visual selected. If hierarchy levels are defined in a visual, you can drill down into the detailed information displayed in a visual, then back up. 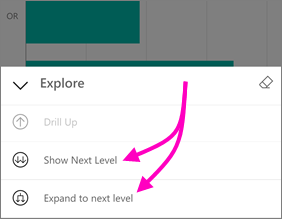 You add drill-down to a visual either in the Power BI service or in Power BI Desktop. 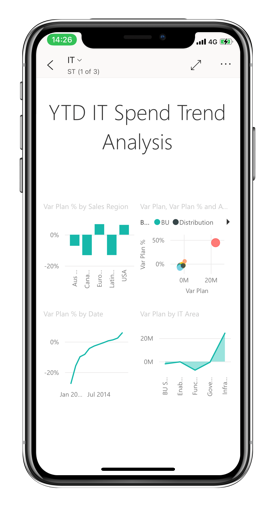 Drill-down only works in phone-optimized Power BI reports when you view them on a phone. In a report on a phone, tap the ellipsis (...) in the upper-right corner > Expand to focus mode. 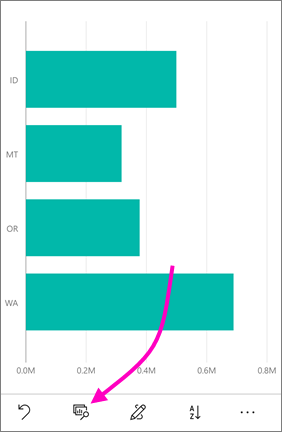 In this example, the bars show the values for states. Tap the explore icon in the lower-left. Tap Show next level or Expand to next level. Now the bars show the values for cities. If you tap the arrow in the upper-left corner, you return to the phone report with the values still expanded to the lower level. To go back up to the original level, tap the ellipsis (...) again > Revert.